The Burning Man festival is not an easy place in which to be separated from your friends, particularly if you don’t speak English and are not used to the hot, dusty Nevada desert where the art and music gathering takes place each summer. Two years ago, a young Japanese woman found herself in this predicament. It was only when she stumbled across the headquarters of Burning Man Information Radio, after having wandered the event’s sprawling grounds aimlessly all night, that her ordeal ended. “She didn’t speak a lick of English, was exhausted and had no idea what was going on,” said Joshua Cunningham, the station’s production manager. Mr. Cunningham immediately broadcast a message over the airwaves asking if there might be a Japanese speaker nearby who could help. Whether reconnecting colleagues, transmitting warnings about encroaching dust storms or providing updates on traffic, Burning Man Information Radio is a key part of life in Black Rock City, the 50,000-person village erected each year for the festival. The low-power station — its signal on 94.5 FM covers a five-mile radius — was founded in 2000 to operate only during the festival. It was created to meet the federal Bureau of Land Management’s licensing requirements, which stipulated that the festival have a communications system to alert participants about critical health and safety issues. Over the years, however, the station has evolved from its mainly public service role into a larger cultural phenomenon. Starting at this year’s festival, which runs from Aug. 30 to Sept. 6, Burning Man Information Radio will broadcast live 24 hours a day (previously, night programming was automated). There are also plans to create an Internet radio station intended to connect festival participants from around the world all year. In 2002, the radio team realized that entertainment was important to its mission. Since then, the station has been developing a mix of news and weather reports, interviews with artists and a wide range of music, including Buddhist chants, sound art and heavy metal. New offerings this year include interviews with festival first-timers, musical performances transmitted live from the bordello-themed stage of the “Dust Fish Camp” (one of the event’s many themed art and social enclaves) and a daily show hosted by the Reverend Billy, an iconoclastic preacher against capitalism , and his Stop Shopping Gospel Choir. As in previous years, the station will let participants make announcements and share their views. “If someone comes in and says, ‘I’ve got a poem,’ we give them the mike,” said Bob Sommer, the station manager. Burning Man Information Radio is not the festival’s only radio station. The desert grounds, known as the playa, are rife with unsanctioned experiments in low-power broadcasting. But setting up and running a 24-hour radio station in the desert presents significant challenges. Audience reception is also an issue. Listeners outside Black Rock City can tune in online, but spotty Internet access makes listening via the Web difficult. Participants generally access the station from their vehicles or carry FM radios. Still, with its offbeat programming produced by about 100 volunteers, the station reflects the all-inclusive, anything-goes quality of the Burning Man experience. “It’s not unusual to be sitting there sipping a cocktail when the next thing you know, there’s a 20-piece mariachi band marching up to perform for you,” said Aeion Solar, the Dust Fish Camp’s radio producer. It is in this spirit that the team hopes to make Burning Man Information Radio a year-round affair, run as a nonprofit, open-source station over the Internet. 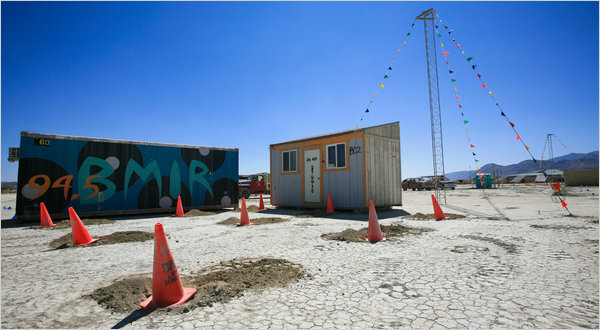 But despite the station’s interest in entertaining people and building social networks among the global Burning Man diaspora, helping participants on the festival grounds remains its primary mission.